Discover 101 Cocker Spaniel dog names for this loveable dog with long floppy ears, endearing eyes and a wagging tail. Cockers are adorable dogs that gently take over your house and your heart. Give them a name that fits. So, what should you call your new pup? Well, Cocker Spaniels can be American or English. Suffice it to say that any British or American sounding name will do. But then again, you can pick any name that suits your fancy. NOTE: If you simply need more information about this breed, review the breed information page. Let’s just say you want to stick to the traditional. “Alec,” “Ace” and “Albert” are great options. A peaceful pup deserves a name like “Chesney” while a dog that makes you laugh deserves the name like “Ike.” (hey, that rhymes) Don’t forget “Irving” which means handsome and “Maximus” to refer to “the greatest” dog you will ever have (at least in terms of temperament and beauty). Female Cocker Spaniel dog names include “Goldilocks” for the sweet curly fur and “Purdy” as in pretty. “Bessie,” “Bianca” and “Roxy” will do as well. If you want to be in with the popular crowd, choose “Bella” for her obvious good looks. Bella also ranks as one of the most popular female dog names. 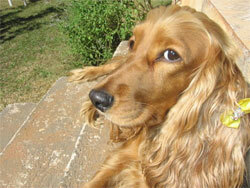 Because Spaniels are also very intelligent, you can name your pet “Sophie” as the name means wisdom. A male Cocker Spaniel can also be named “Otis” for being of good hearing, as one of the features that most of these intelligent animals possess. In the end, it’s up to you to pick the best name for your pup. The idea is to consider the things you love about your dog and pick something that fits. Here are 101 Cocker Spaniel dog names to consider. Famous Name: Edwin Eugene “Buzz” Aldrin, Jr. (born January 20, 1930) was an American astronaut landed on the moon next to Neil Armstrong. “Return to Earth” (1973) and “Magnificent Desolation” (2009) are two memoirs wrote by Aldrin. Famous Name: Born on December 8, 1976, Dominic Monaghan is an English actor best known for his role in the movie “Lord of the Rings”. He was born in Berlin, Germany but his family moved to England. He was also one of the cast in the hit series “Lost” where he played the role as “Charlie”. Echo Repetition of a sound caused by the reflection of sound waves. For one that barks or meows a lot. Famous Name: Being naturally-born class clown, Eddie Murphy (Born on April 3, 1961) already doing stand-up gigs when he was 15 years of age. Because of his exceptional talent in Comedy, he became one of the backup performers on the NBC comedy weekly Saturday Night Live. He voiced the role of Donkey in the hit animated film series Shrek. Famous Name: St. Gideon is the son of Joash according to Judges 6 – 8. Gizmo A mechanical device or gadget. Irving Beautiful/Handsome. Most appropriate for the Cocker Spaniel dog names list. Kramer Zany character Cosmo Kramer in US TV sitcom “Seinfield”. Famous Name: Born on Springfield, Missouri on November 23, 1984, Lucas Grabeel, is an actor who became famous for his role Ryan Evans in a Disney Channel Original Movie High School Musical. Before his successful High School Musical career, he appeared in installments of the Halloweentown series Halloweentown High. Luke Light. Added to the Cocker Spaniel Names list for Star Wars fans. Famous Name: Maxwell Davenport “Max” Taylor was a U.S Army four star diplomat who was born on August 26, 1901, Keytesville, Missouri. During Korean war, he became a superintendent of West Point and directed UN forces. Taylor was also a trusted adviser to John F. Kennedy. He died in 1987. Nelson Son of Neal. Or for fans of Nelson Mandella. Nemo After the 2003 film “Finding Nemo”. Otis Good hearing. One of my favorite male Cocker Spaniel dog names. Ozzy From Osbert – Divinely bright warrior. Or, for those who love Ozzy Osbourne. Famous Name: Pablo Ruiz Picasso is a famous painter, artist, and also considered as one of the most recognized figures of the 20th century because of his work during his career. He started to paint when he was eight years old. He created 13,500 paintings, 100,000 prints and engravings, and 34,000 illustrations which were used in books. Paddie From Patrick – One of noble birth. Also Paddy. Paddington Suburb in London In Michael Bond’s book, A Bear Called Paddington, the little bear was found on the railway at Paddington Station, London. Famous Name: Stanley David Griggs (1939-1989) was a NASA astronaut and a United States Navy officer who graduated from the US Naval Academy in 1962. In August 1979, after finishing a year of training and evaluation, he became eligible for Space Shuttle flight crew assignment. Tigger Boundless tiger in the “The House at Pooh Corner” from Winnie the Pooh. Woody Passage in the woods. Or, for those who love Toy Story. Ziggy Reggae singer Ziggy Marley. David Bowie’s 1972 album “The rise and fall of Ziggy Stardust.” The name of a comic strip. Can’t find the name you like on the Cocker Spaniel dog names list? Don’t give up. Return to our Dog Names by Breed page to do some more exploring. If you have a great name, tell us about it!